Today marks the final part of the Stampin' Up! 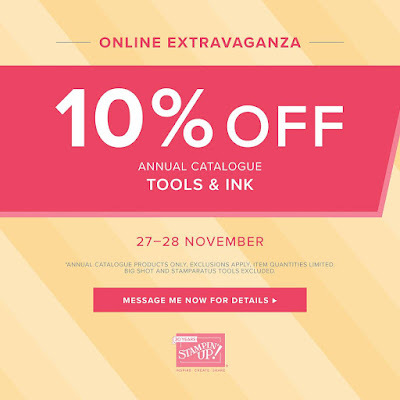 Extravaganza with a two day online sale which sees a 10% discount on tools and ink from the Annual Catalogue. Exclusions do apply in relation to the Big Shot, the Stamparatus, Bundles, some punches and other miscellaneous supplies. However by clicking on the image above, it will be clear just what has been discounted. This promotion will end tomorrow at 10.50 p.m. GMT.